Following are two products of behavioral economics employed by two separate utility companies. The first one is from the electric company and uses peer pressure to make you aware of your energy consumption. 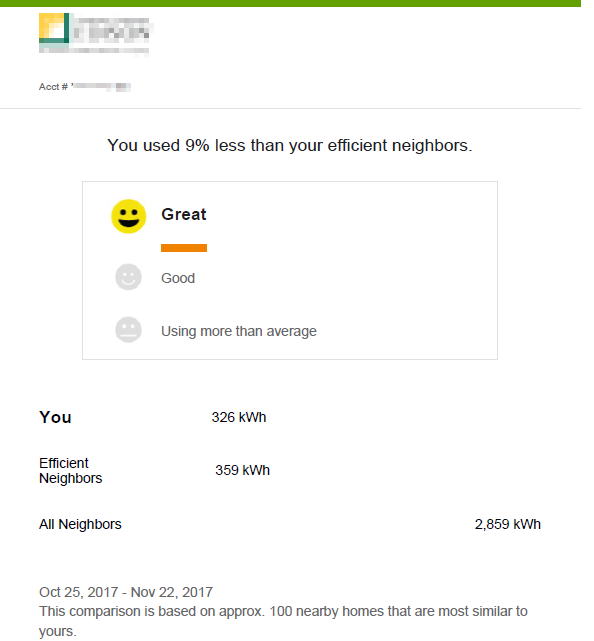 And, the second one is from the gas company that simply conditions you to increases (especially seasonal increases) in your bill. Yes, your utility company will extract as much money from your pocket as possible given the existing political circumstances. I say "political" because most utilities are regulated and their rates (tariffs) and taxes are often a function of a political process. So the trick is not to surprise you with a large emotion-producing bill at the end of the billing period, but to provide you with some indication of what is coming and give you the illusion of control. Allowing you to choose between turning on the heat or simply wearing an additional sweater. In fact, it is often better to over-estimate the total amount to allow the ratepayer to feel that they have managed the system well and as a result, enjoy the bonus of a smaller bill. Thus turning potential complainers who may tie up customer service lines with complaints into satisfied customers who accept the bill -- assuming there are no errors or major surprises -- as it is presented. By providing period-to-period comparisons with previous bills, you also build additional trust into the system and give the illusion of even greater control.